I have a confession to make. When I first saw a trailer for MonsterBag, I didn’t quite get it. All I could gather from the clip was that it looks cute and has a bit of a goofy story attached to it. But I was certainly intrigued by what I saw. Brought to us by Chilean developer IguanaBee, MonsterBag is a puzzle action game featuring a little blue monster called V, and his owner/friend Nia. The game follows V’s journey as he tries to reunite with Nia while accidentally starting an apocalypse that results in him encountering strange things, people, and creatures along the way. The in-game world is a cruel place for monsters. The second V is spotted by people or creatures, he gets killed in some of the most brutal ways that you can think of. Therefore, players have to sneak past everyone to get to Nia while undertaking a variety of challenges simultaneously. MonsterBag can seriously test your patience at times. Let’s get one thing out of the way; if you get frustrated easily, MonsterBag isn’t for you. There are no tutorials to spoon-feed players, and the second you hit the start button, you’ll be thrown straight into the game with little guidance about what you’re supposed to do. In a way, it reminded me of old-school puzzle games in that you get on with it, and things can get tough. I spent a little bit of time trying to figure out what the heck I was doing and why, but once I got the hang of it, I was hooked and I struggled to put my handheld down. Players have to use the d-pad to move V from left to right, or right to left, depending on the stage. The touchscreen is used to pick up items of use and to fling them towards targets, and the right analog stick is used to move the camera around. Sneaking V past people and creatures isn’t as easy as it sounds, especially during later stages. Certain characters have the ability to spot monsters and are actively looking out for them so players have to avoid their gaze at all times. It’s hard to describe the type of puzzles that MonsterBag contains in one sentence. Some of the puzzles are noticeably inspired by pattern recognition and sequence questions found in aptitude and IQ tests. These are the stages that I personally enjoyed the most. Other stages seemed to be less about puzzle-solving per se, and more about timing. Admittedly, I got through some stages simply by trial and error rather than logical thinking. MonsterBag gets frustratingly challenging in some parts, particularly when players are required to solve puzzles, time moves, and avoid death all at the same time. But where the frustration results from a flaw in the game is when it’s all down to chance. Some stages seemed to be dependent on the player’s luck rather than skills, and those stages can be very tedious to get through. However, beating them does feel equally rewarding, and I appreciate IguanaBee for putting in the effort to make something unique and original. Unfortunately, however, there is a bit of repetition towards the second half of the game, which makes it seem like the developer ran out of ideas. The game is short so the repetition is slightly disappointing to note. If puzzles are your thing, MonsterBag shouldn’t take you more than 2-3 hours to beat. There are 18 stages in total (and a credits stage), and I managed to unlock the final stage within five hours. However, you can prolong your time with the game if you wish to climb up the leaderboards by clearing out stages as quickly as you possibly can. MonsterBag comes with a Teen rating, which might surprise some people. But the game’s dark and gritty world warrants it. Death is inevitable, and you’ll find yourself getting shot at, stomped on, and sliced up in a variety of ways. While describing the game, IguanaBee gave us the simplest version of the story but it’s a lot more than a monster trying to reunite with its friend. A lot of the story is open to interpretation, and I probably have a different understanding of it than the next person. Instead of spoiling it, I’ll let our readers come up with their own version. That said, I think the story would have enhanced my overall experience had it been narrated verbally or through text. There were parts in the game where I was solely concerned about getting through rather than looking around and figuring out what was going on. 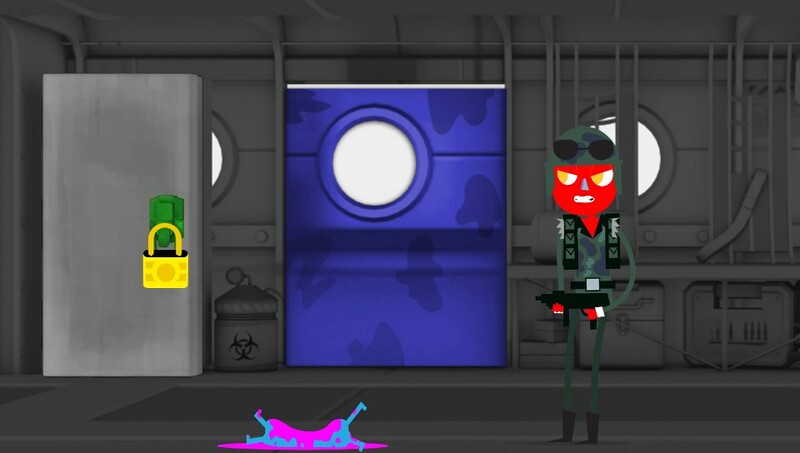 MonsterBag‘s art style, presentation, and soundtrack are commendable. Its weird and eccentric world drew me in to the point where I attentively watched all of the un-skippable cut-scenes out of curiosity. Usually, I’d moan about not being able to skip them, and I’m sure this will annoy some folks, but the only time I had an issue with it was when I’d have to restart a level and watch the whole shebang again. Sadly, death isn’t the only reason I had to restart certain stages. I encountered a few odd bugs, and one of them resulted in my character freezing, requiring me to start the level again. MonsterBag isn’t a game for everyone and there’s nothing wrong with that. Its uncanny nature makes it a pleasure to play, and the challenge it poses makes it rewarding to beat. Those who enjoy competition can take it a step further by submitting their results to the leaderboard and beating other players. On the other hand, the game suffers from a few odd bugs and a little bit of repetition – the latter of which is also a problem because the game is short. All these factors do put a bit of a damper on an otherwise good game that’s worthy of praise. Note: MonsterBag costs $9.99 but is currently free for PlayStation Plus subscribers via the April 2015 Instant Game Collection. A review code for MonsterBag was provided by Sony. For more information on scoring, please read our Review Policy here.